Cambodia was under French colonization for 90 years from 1863 until 1953. Beside the 1907 Franco-Siamese Treaty concluded by French authorities on behalf of Cambodia with Thailand (known as Siam at that time), France did not make any specific claims over Cambodia’s maritime zone. What French authorities did is to make a Kret (Regulation) in 1936 for the protection of fisheries off Cambodia’s coasts. This 1936 Kret mainly concerned fishery jurisdiction, navigation, and punishment for illegal acts in the territorial sea of Indochina. After receiving full independence from France, Cambodia made its first claim for maritime zone in 1957. Along with this, Cambodia also started to claim for straight baseline for its maritime zones. This first baseline claim is relatively modest in nature. It consists of 12 segments linking a mixture of 13 defined islands and mainland coastal points. Figure 1 illustrates the 1957 straight baselines claimed by Cambodia. As shown above, the 1957 baselines are divided into three parts: the northern, the middle, and the southern. First, the northern part starts from the terminus of Cambodia-Thailand land boundary terminus on the coast to the islands of Koh Smach, which lies closely to the coast. Second, the central part links a number of island located across the mouth of Kompong Som Bay. These islands are further offshore than the islands located in the northern part. Third, the southern part incorporates three points, where the baselines proceed to the southern mainland coast until it reaches the intersection of the Cambodia-Vietnam land boundary. Even if the claim of the 1957 baselines originated before the 1958 Geneva Convention on the Territorial Sea and the Contiguous Zone, the baselines claimed by Cambodia accorded with Article 4 of this convention. The baselines claimed by Cambodia did not depart from the general direction of the coast as the distance from one segment to another is relatively short and some parts of the baseline were drawn based on low-tide elevations. In addition, the average length of the baselines’ segment was 11.95 nautical miles, and the average distance of the offshore islands used as basepoints was 6.93 nautical miles. These made the 1957 straight baselines claim comfortably passes any disagreements. As stated earlier, Cambodia also made its first claim to the territorial sea and contiguous zone in Kret No.662 of December 30, 1957. 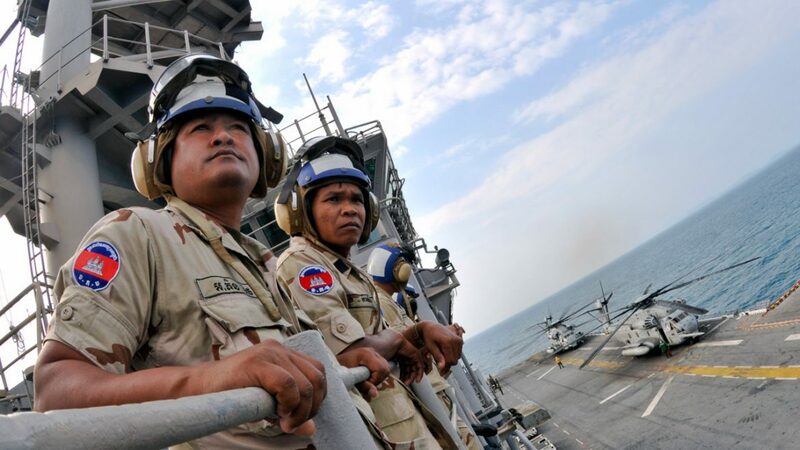 Based on the Kret, Cambodia claimed 5 nautical miles of territorial sea from the baselines, 7 nautical miles of contiguous zone form the outer limits of territorial sea, and continental shelf up to 50 meter-depth isobath. 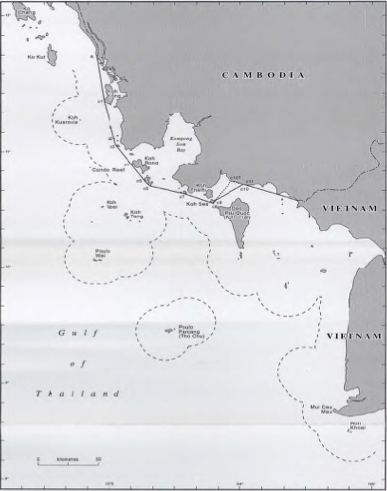 After becoming a party to the Geneva Convention on Territorial Sea and the Contiguous Zone in 1964, Cambodia revised its claim on territorial sea up to 12 nautical miles. Furthermore, Cambodia also claimed for exercising of its power on the continental shelf area without stating specific limit for its continental shelf’s claim. After the government changed from the Kingdom of Cambodia to Khmer Republic, Cambodia granted exploration rights over Cambodia’s entire continental shelf to the French Elf-ERAP group on February 21, 1972. 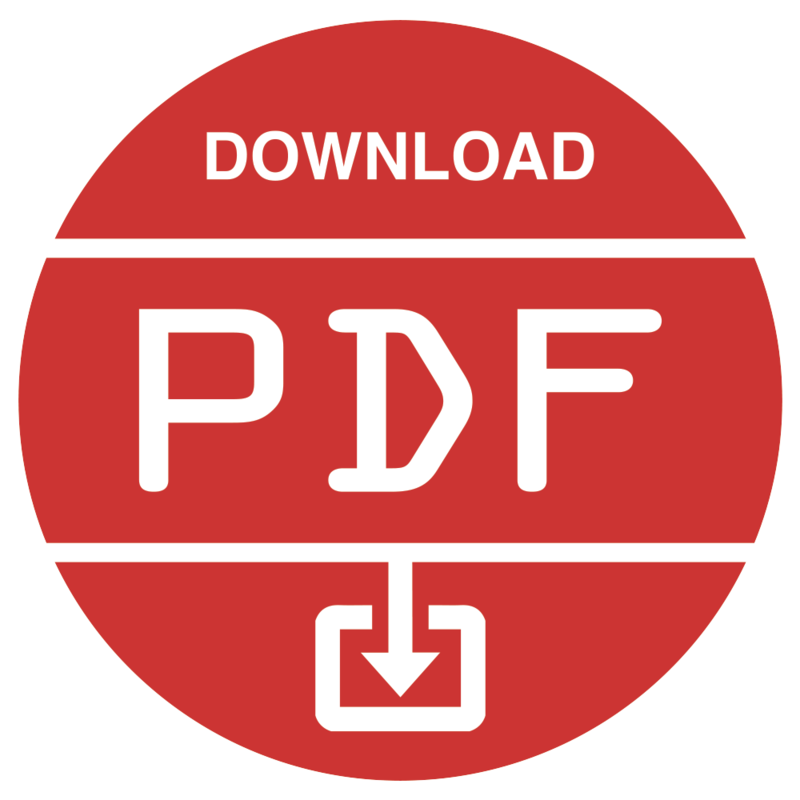 Moreover, Cambodia revised its claim for continental shelf by Kret No.439/72-PRK of July 1, 1972. Figure 2 depicts the continental shelf claimed lines by Cambodia. As shown in Figure 2, this Kret allows the adjacent boundary to be created by the straight line joining the Cambodia-Thailand land boundary terminus of the coast to the highest point of Koh Kut (Kut Island) and extending up to Point P in the central of the Gulf of Thailand. Furthermore, Cambodia revised its position on the straight baselines by Kret No.518/72/PRK of August 12, 1972. These 1972 straight baselines were different from the previous one. These baselines consisted of 20 segments and the basepoints used for constructing the baselines were substantially further offshore than those selected previously. This 1972 baseline is shown in Figure 3. 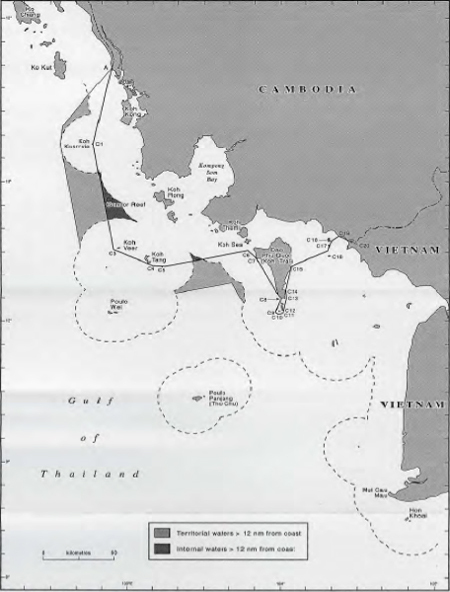 As depicted in Figure 3, the 1972 straight baselines system can be divided into three sections: the northern and central area, the area in the vicinity of Koh Tral (Phu Quoc island) and the area inshore of Koh Tral. This made the 1972 straight baselines represent a crucial extension of Cambodia’s claim over those of 1957. There is a lot of criticism with regard to the selection of basepoints used for constructing the 1972 baselines. 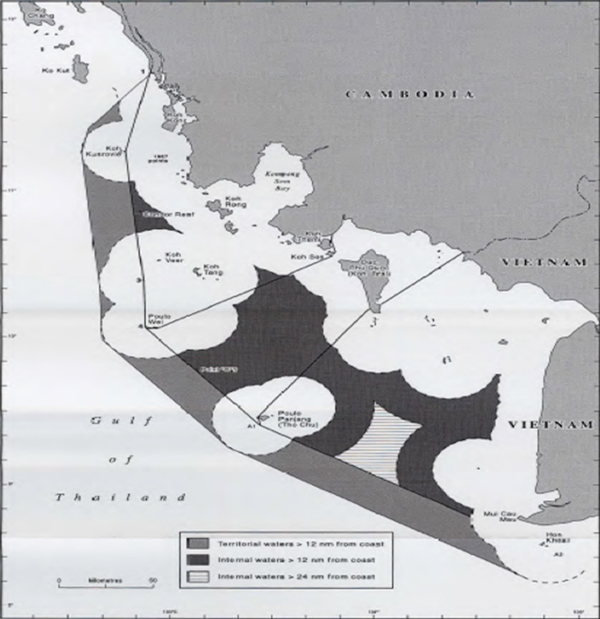 However, one important notice of these 1972 baselines is that it has incorporated Koh Tral Island as part of Cambodia’s territory. Later, at a meeting of the Third United Nations Conference on the Law of the Sea in 1976, the Cambodian government made a statement on their rights and obligations of coastal states in the territorial sea, contiguous zone, the EEZ, and the continental shelf. This symbolized the first recognition by Cambodia of the regime of its EEZ. However, Cambodia again did not mention the limit of its EEZ and continental shelf. On January 15, 1978, Cambodia made its first claim for an EEZ up to 200 nm in a Statement by the Spokesman of Ministry of Foreign Affair. 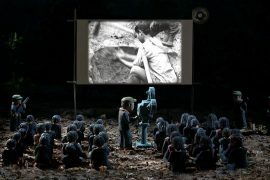 Then, with the rapid change of political regime from the Democratic Kampuchea to People’s Republic of Kampuchea, the Council of State issued a decree on July 31, 1982, which comprehensively revised its straight baselines system. This decree further extended Cambodia’s claim by utilizing islands further seaward from Cambodian mainland as basepoints. To fulfill this goal, Cambodia had simplified its straight baselines by reducing the number of basepoints from twenty to five points. Scholar like Schofield has commented that the motivation behind this revision was to facilitate the conclusion of the Historical Waters Agreement with Vietnam of August 7, 1982 and to enhance Cambodia’s position in the negotiation with Thailand. Figure 4 presents the 1982 straight baselines claimed by Cambodia. As shown on the map of Figure 4, the 1982 straight baselines comprised of five basepoints. Out of these five points, Point O was not decided at that time. However, Article 3 of the Historic Waters Agreement between Vietnam and Kampuchea (Cambodia) described Point O as being “situated on the high seas on the straight baselines between Tho Chu ‘Poulo Panjang’ Archipelago and Poulo Wai ‘Wei’ Islands. On the other hand, the Agreement between Thailand-Vietnam in the Gulf of Thailand of August 9, 1997, Point O was defined as the equidistant point between the Poulo Panjang group of islands and the Poulo Wei group of islands. Thus, the 1982 baselines system is a unified system linking the straight baselines of Cambodia with those of Vietnam. An observation of the three baseline systems claimed by Cambodia in 1957, 1972, and 1982 shows that the 1982 baseline system represents a major departure form the earlier claims. The 1957 baselines and the 1972 baselines incorporated the Poulo Panjang group of islands into the straight baseline system; however, the 1982 baselines excluded the Poulo Panjang group of islands. The 1982 baselines claims received much criticism from other countries especially Thailand and the United States of America. Thailand alleged that the government of Phnom Penh is illegitimate; therefore, Thailand refused the validity of any agreements or declarations made during that time. 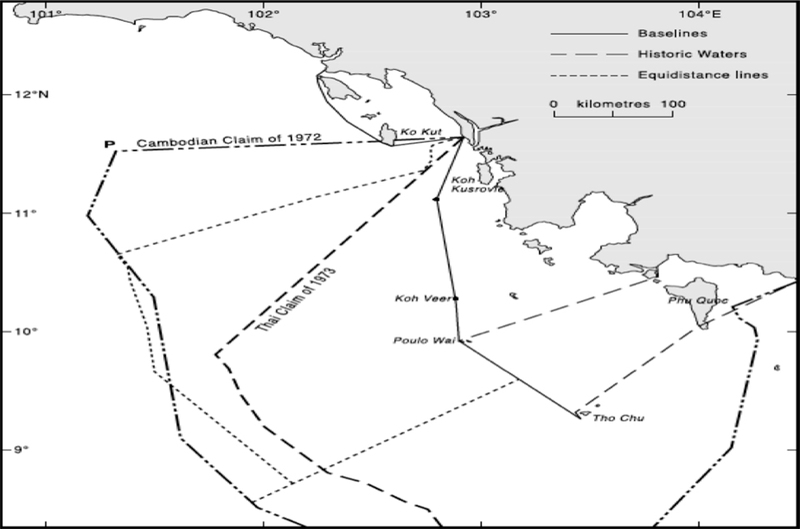 The straight baselines in 1982 were considered by some countries as unacceptable due to the unreasonable selection of basepoint, which were further offshore and turned away from the general direction of the coast. Apart from revising the claim on the baselines system, the 1982 Kret reiterated Cambodia’s position on the claim of territorial sea, the EEZ, and the continental shelf. Additionally, this Kret touched on the historic boundary between Cambodia and Thailand, which specified in the 1907 Franco-Siamese Treaty. In conclusion, Cambodia has significantly claimed for its maritime zones and baselines even before the adoption of the Geneva Convention and the United Nation Convention on the Law of the Sea (UNCLOS). Cambodia made an impressive job with regard to the claim of the straight baselines in 1957, which is conforming to the international law of the sea. However, for the lateral claims of its straight baselines in 1972 and 1982, Cambodia seemed to depart from the practice of other states as well as what is enshrined in international law; therefore, resulted in criticism not only from scholars but also from the other actors in international law. For the claim of its maritime zones in the territorial sea, the EEZ, and the continental shelf, Cambodia’s claims are not different from those of the other states. Cambodia has claimed for 12 nautical miles of a territorial sea and 200 nautical miles of the EEZ from the baseline. With regard to the continental shelf, current claim has not been altered since the 1972 as shown in Figure 2 above. Nonetheless, these claims specifically in the EEZ and the continental shelf resulted in an overlapping claimed area with its neighboring states, Thailand and Vietnam. This is a huge matter involving law and policy. This is not a matter that can be settled within a day, a week, a month, or even a year. This is a matter of maritime boundary delimitation involving a plurality of states, and negotiation and settlement of this matter might take at least a year or even up to a decade. 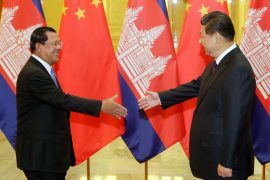 Cambodia’s bureaucracy and China, friends for benefits?